We all have a story to tell. Tonight people travelling from Ottawa to Tampa on West Jet 1274 might notice that there is a child aboard. He will be the rambunctious seven-year old who is trying to push his way past the crowd that are also eager to board, likely in Section 1. Unless they are looking closely they will miss that he is carrying an EpiPen about his waist. 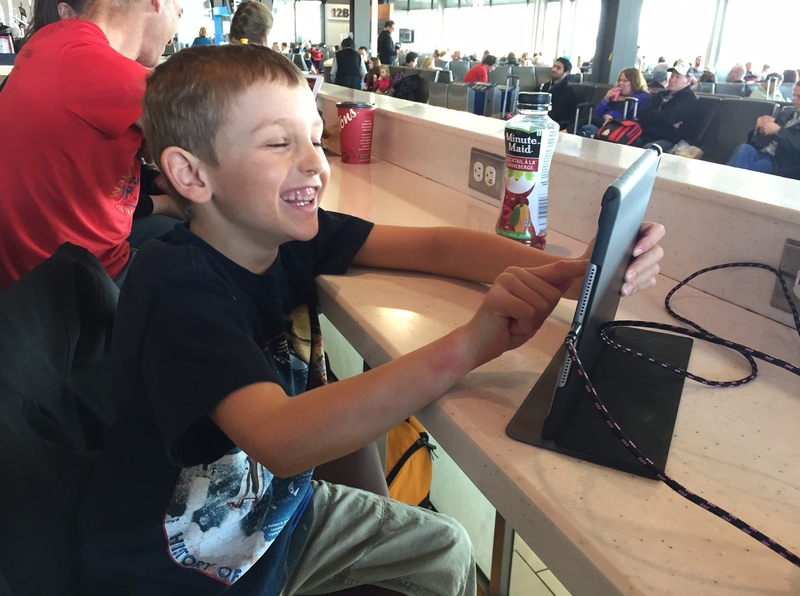 And, unless they are reading this blog post – and the chances are highly slim – they will certainly miss that they are travelling with a remarkable boy who survived a near-death experience, after ingesting a single pistachio. It happened when Paul was just three years old. The ambulance crew told us later that they thought they were going to lose him. It’s a story that has completely altered our outlook as a family. And, my husband and I are determined that our son won’t miss out because of his food allergies. Through this experience, I learned that death is not always like it is shown in Hollywood where an entire 2-hour movie might be about the slow, and inevitable death of a frail old lady, or a person dying of cancer. In some cases, death can be quick. Had I given him the EpiPen immediately, he may have responded more quickly. But, because I delayed administering epinephrine it could have very well cost him his life. My son’s food allergies are serious enough that he can die in as little as five minutes without medical intervention. The photo I provided above was taken during his first, and only experience with anaphylaxis. Before he reached the hospital, both eyes had closed and he was losing consciousness. What this means for our family is that we have to be hyper vigilant about what my son eats, and how it is manufactured. I’m usually the one who reads all the labels, and plans what we eat. Managing what my son eats is a huge responsibility. Food allergies do limit what he can eat, but they don’t have to limit his opportunities. Tonight, I’m terribly proud to be married to someone who acts on his word – someone who is taking our son to Tampa to visit our boat for a week, despite the fact that he had to make several calls home tonight to verify foods that are safe for our son, Paul. In the end, my husband determined that in a sea of offerings – my son could have fish and chips for supper tonight. That sounds good to me. Planning what our son can eat requires persistence, patience and creativity. But, because we know what he needs to avoid it doesn’t have to be difficult. I believe that, with vigilance, my son might never, ever, have an allergic reaction again. And, it is this vigilance and attitude that carries us through the idea of travelling, perhaps even circumnavigating with our family, which includes our son who has food allergies. Here’s a picture of Paul taken tonight at the Ottawa airport. I really believe people come into our lives for a reason…I am so glad you and I connected. measures. I love reading about your adventures. Happy Sailing!! !